I was in a small hotel in Belgium where they gave one Wifi, with code, per room per day. On airplanes, Gogo can only be used on one device. Boingo and Skype Wifi both work with one computer at a time (as far as I can figure) and both charge by time. When I first hit that situation in Belgium, we had two laptops which both had ethernet ports, and we had an ethernet cable. So we shared the connection: Laptop 1 logged in via Wifi and used Internet Sharing to share via ethernet to Laptop 2. Laptop 2 connected to the internet via ethernet and used Internet Sharing to share that over Wifi. Worked fine, but we had to keep both laptops on to use our phones, etc. Plus, no current MacBooks have ethernet, so this would necessitate two ethernet adapters today. My next solution was to carry a small travel router that creates its own Wifi network (great for hotels – I like the TP-LINK TL-WR702N, but there’s a newer model). In a hotel, I plug that into ethernet, and I’m done. On a plane, I connect my MacBook to Wifi with Gogo. 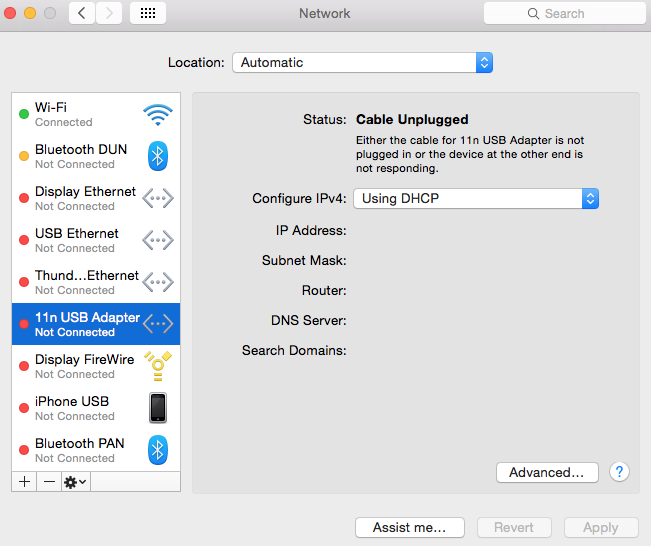 Then I connect my USB-ethernet adapter to this router and share from my laptop. This works, but it’s a lot of parts, and uses two USB ports (one for the network and one to power the router). On to the one I’m pretty happy about, and the main subject of this post: a tiny USB-Wifi adapter from TRENDnet. The model I got is the TEW-648UB. It’s about $8 on Amazon. And it’s really tiny. And it gets all of its power via USB. The biggest annoyance with this method is that you have to install a driver. I hate that. I wish things were just generic enough to work. This isn’t. And the latest driver seems to be for Mac OS 10.8. But I installed it, and it works just fine. The setup is a little clunky, but not too bad. Buy the TRENDnet TEW-648UB. Here’s an Amazon link. Download and install the latest Mac driver (10.8 at the time of this writing). 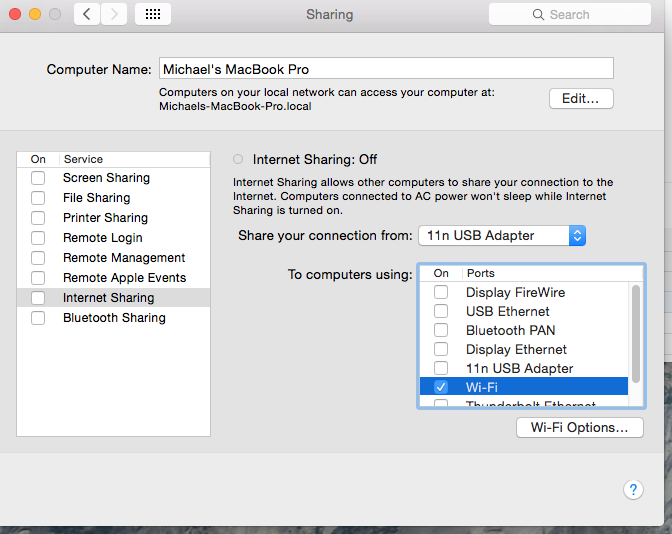 Once the Share pop-up has the adapter and the To area has the built-in Wifi, then click the box on the left to start the sharing. 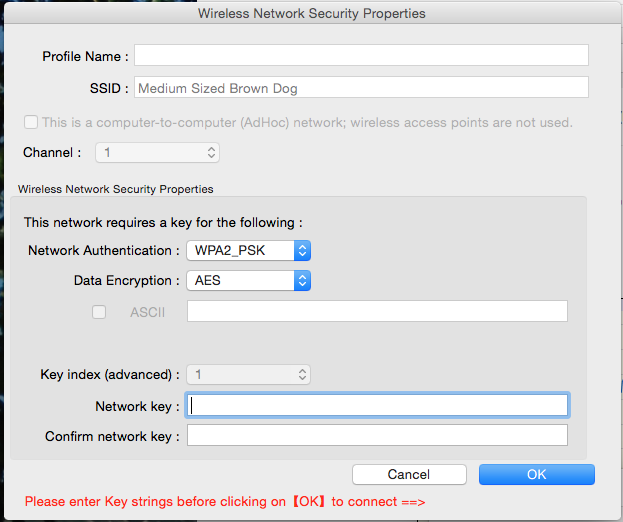 If you’ve never shared a network from this Mac before, be sure to go into the options to give your new network a good name and a password. From here, your other computers/tablets/phones should be able to connect to the network you created. Third party apps eavesdropping through an iPhone? Shazam? So here’s how it works: you click the button “tag now.” That’s it. It listens, and uploads the audio. It never asks your permission. Interestingly, Apple has been careful to include a warning when apps ask to determine your location on the iPhone. That’s a nice privacy control. But any app can listen in when it’s open. Seems like a hole waiting to be exploited. I installed the app on my iPhone and all I needed to do was enter my info and off I go. Looks pretty easy, so far. I’m not sure how rich this editor is. I don’t see a way to enter links, or even add pictures, but I’m sure features will be added as time goes by. OK. I can add photos (or take them from within the app) once I’m done with the keyboard. No links that I can find so far. 3G iPhone: Will I use other GPS? Garmin Forerunner 205: Great running watch, with current readouts, plus I download info from runs into my Mac. Then I keep a history on my Mac and get full stats. In car navigation (x2 – my car and my wife’s both have it). This costs almost $2K per car, and, frankly, it’s not amazing. The screens are big, but I doubt I’d get it in my next car. Garmin Nuvi: Shared purchase, we trade it around for use on trips. But I also have an iPhone, and I’m likely to get a new iPhone 2.0 like the rest of the six million users out there. So, since it’ll have real GPS, with Google Maps, no less (the best, to me), will I use these others? 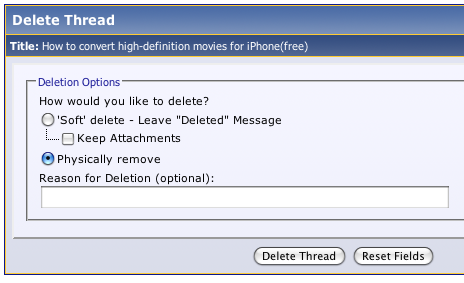 It seems that their functionality should all be easy to replicate on the iPhone, maybe with some App Store intervention. The running functionality should be a snap. The only issue is the display – I can’t really wear the iPhone on my wrist to get current info. So maybe it’ll be good (I’ll check my situation less often) or maybe I’ll get an armstrap – this is all assuming someone writes a running app. The car functionality should be easily replicable with the iPhone. It’ll probably even be better. The Nuvi does have some unique features, like the ability to set points of interest for trips. But, again, I’m guessing someone (maybe Garmin?) will build that into an iPhone app. My guess is, the rest of the GPS world just got dealt a sizable blow here. 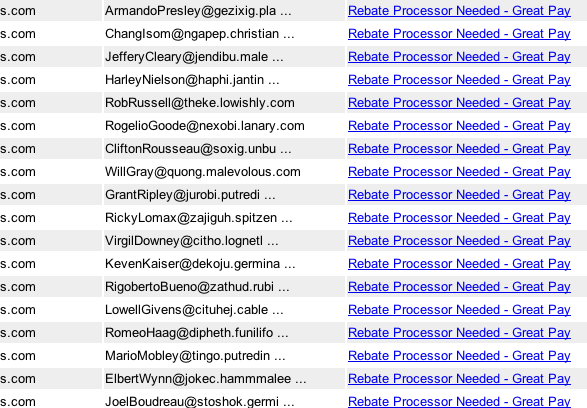 I’m not sure how Postini works from the algorithm level, but it doesn’t seem to do anything about two sets of emails, and I must be on the top of the least for each of them. The first are emails with titles like “85% discount. Coupon #PqG1.” After I get a few thousand of these, won’t Postini figure this out? By the way, the body of these emails is usually something like “Dear michael, be intelligent, buy your meds from the best shop since 2000. ” So there isn’t even a hyperlink in there. I wonder how low of a response they’re looking for. Since they also spoofed the return address, I’d have to work really, really hard to patronize these guys. These all came in a row, but I’ve got many more. Will Postini catch on here? Now, granted, I’m very happy with Postini. I came from SpamAssassin, and I really, really prefer Postini. But they must have tens or hundreds of thousands of these identical emails – I have over a thousand. So why am I seeing them? They weed out plenty of other garbage from my bulk mail – please get rid of these too! 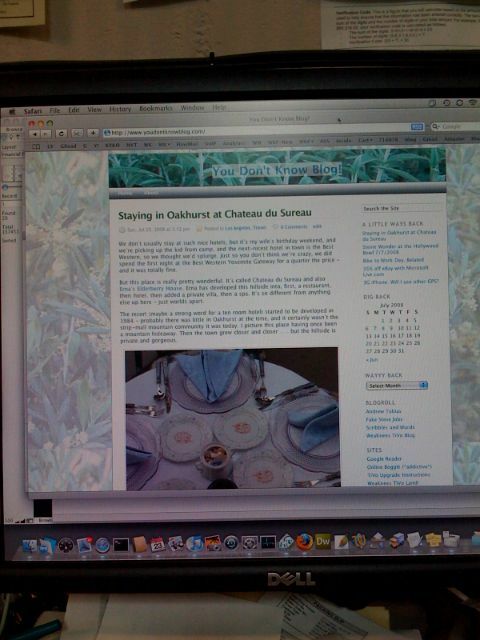 Long time readers will know that I just started this blog. Since I installed this on my Mac Mini, I decided I needed a way to back up the SQL data. If this Mac fails, this blog is toast. Most of what follows applies to any Linux machine. I wrote a pretty simple script to run the backup. If you want to do something similar, use Terminal on the host Mac (or you can login remotely, but that’s another story). Go to a directory where you keep scripts (maybe “/usr/sbin” – you can do that by typing cd /usr/sbin). Then create a file named something like blogbackup.sh (to do that, type vi blogbackup.sh). Then, since you’re in the editor vi, you’ll need to press “a” then paste the following, replacing password with your SQL password, and backup with your secondary hard drive (or replacing /Volumes/backup with a different location on your primary drive, but that defeats half the purpose . . .). To save in vi, press ESC then :w then :q. That basically says at 2:10 AM, run that script everyday. Save and quit with :w then :q.
order status and refund requests (if any). was already processed and will still be received within the timeframe provided. we are making the transition. have the option for combined payments as well. sure to include yuour Ebay userID when sending us an email or message. All strange capitalization aside (this company does sell on eBay, after all) I’m sorry the party stopped just after I found it. But discount subscriptions are still out there. Just never, ever use the renewal forms right from the magazine. Go to a third party website like magazines.com or the one above. In my experience, they’re cheaper every time. One, I just found. A friend from high school emailed it to me. It’s called Stuff White People Like, and it’s amazing. Maybe even better are the comments. Somehow, this guy tapped into a pretty funny community. The other tied-for-funniest blog I read is the Fake Steve Jobs blog. Half of the posts are just of the variety of “I’m speechless” with a link to a YouTube video or something, but even those are good editorial choices. Beyond that, his relentless attacks on the Borg (Microsoft), Hillary, Faceberg (Zuckerberg of Facebook), and, really, himself (the real Steve here, since he’s supposedly writing this) are really well written, and endlessly entertaining. I posted last week about people posting on forums with really polished threads, solely to get links back to their sites. They get good screen shots, carefully tested info, and, of course, very specific links that they want to juice in Google. Here’s a strange one: buying magazine subscriptions on eBay is surprisingly inexpensive, and it seems to really work. New subs or renewals, there’s a lot of money to be saved. I had always used sites like magazines.com for my subscriptions; they’re generally much cheaper than going directly through the magazine’s renewal service, and generally easier too, since you can go online, do four different renewals in one transaction, pay by credit card, and be totally done. But my cousin heard about a better way: eBay. We’ve been speculating as to why this occurs, but like many oddities on eBay, we couldn’t really explain it. His theory is that since magazines basically don’t make their money on subscriptions but on ads, they want to raise their paid subscriber counts, thus getting more in ad revenue. So this is another way to get new subscribers (that’s the older term for “eyeballs” apparently). Here’s an example: at magazines.com, The New Yorker is $47/year. On eBay, I can find that for about $24 (here’s a link, but it’s a live search, so you may find different prices when you try it). And here’s the worst par: on newyorker.com, the one year costs $39.95, which makes me feel like a real dolt for ever using magazines.com. I took the plunge and set up a renewal. The company I selected had tens of thousands of good feedback – all from mag subscriptions, at least as far as I could tell. Saved some money . . .